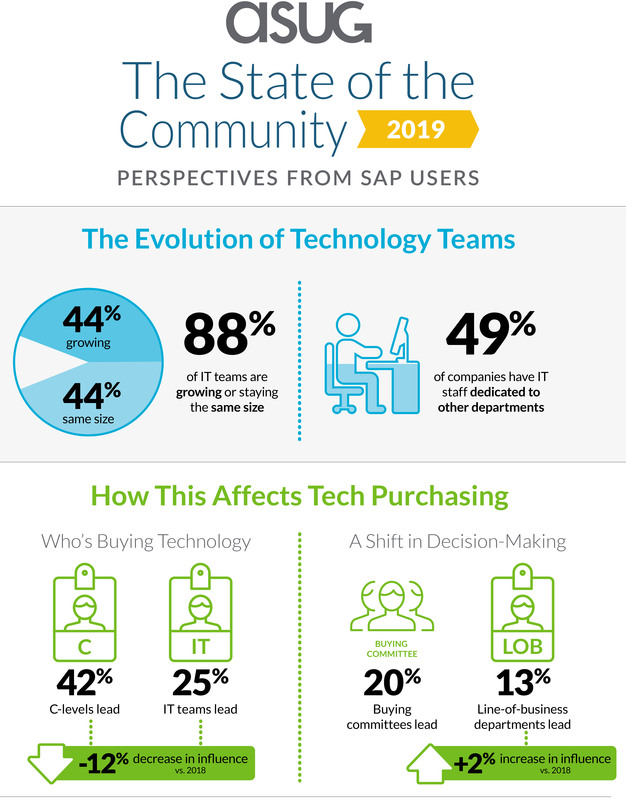 ASUG’s annual State of the Community study explores the attitudes and preferences of the SAP users who are our members, along with where the industry is headed. This is the second year we’ve been tracking these trends, and we’re seeing some shifts in 2019. The infographic covers the key topics in the study, including the state of SAP S/4HANA transitions, the evolving roles of IT and line of business departments, and the effects of a company’s innovation on its individual workers. Don’t miss what we learned in this year’s study. Founded in 1991, Americas’ SAP Users’ Group (ASUG) is the world’s largest SAP user group, serving 2,300-plus businesses via company-wide memberships. ASUG’s mission is to help people and organizations get the most value from their investments in SAP technology. The Chicago-based organization accomplishes this by connecting and educating people through in-person and virtual events, delivering customer feedback to SAP, and advocating for its members. Find additional information at asug.com.